For many holiday destinations there are a few ‘must do’ activities or specific places to visit. Here in Provence we’re lucky to have our very own destination venue – The Circuit Paul Ricard Race Track! This incredible complex and homage to motor racing was built in 1969 just outside of the picturesque village of Le Castellet by Paul Ricard, the drinks magnate who created Ricard, an anise and liquorice-flavoured aperitif in 1932 (it’s delicious – if you’ve not had it then try some when you’re next on holiday in Provence!). The new circuit opened in 1970 taking just 10 short months to construct and quickly became the premier venue for French motorsport securing the French Grand Prix which it hosted from 1971 for 14 years (more on the Grand Prix later!). The track was built alongside its very own airfield that was also owned by Paul Ricard (who in addition to a racetrack and airfield added two private islands to his list of assets during his lifetime). The easy access and warm climate meant it quickly became a popular testing venue for motor teams around the world. It was also renowned for being one of the safest tracks around due to the iconic red and blue stripes that instantly make this track so recognisable. As well as being visually arresting, they act as high grip areas and replace gravel traps of old as a way of slowing vehicles which run off the track. A number of other safety features meant that the track was recognised in 2007 when the Institute for Motorsport Safety bestowed the First Centre of Excellence award on the circuit. One of its most famous features which can clearly be seen from aerial photos is the mile long stretch of track known as the Mistral straight. This fast run terminates in the Signes corner… not for the faint-hearted driver! 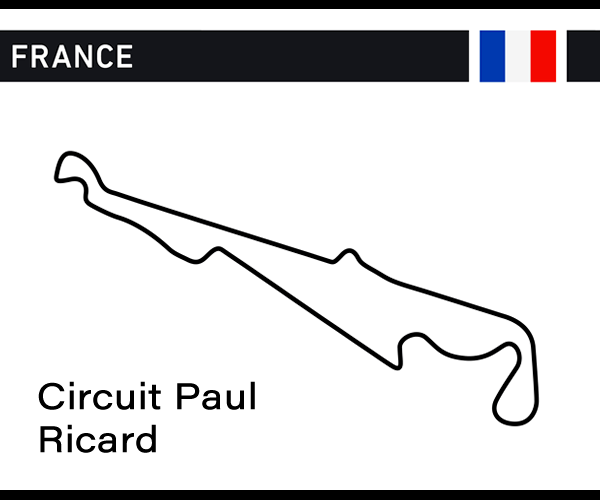 Today, the circuit hosts a variety of racing events and track days, the most famous of which is the French Grand Prix. For nearly 30 years the French Grand Prix was missing from the Grand Prix calendar but was resurrected to its rightful home in 2018. The 2019 French Grand Prix is being held this year at the circuit on Sunday 23rd June. Tickets are still available to what promises to be a truly exciting race weekend which kicks off on Friday 21st June with Practice sessions and qualifying running through to the Grand Prix itself on the Sunday. It offers a perfect opportunity to take a holiday in this wonderful area of Provence. Book a villa or hotel for a week or even two and take the time to enjoy exploring the region, tasting some fabulous foods and wines as well as making the most of a front row seat for the Grand Prix itself. Needless to say, the event is hugely popular so book tickets and accommodation as soon as you can. Whilst the Grand Prix is without doubt the highlight event of the year, the circuit has a busy events calendar which runs throughout the year. Check out the Circuit website calendar for full details. For those of you that have always wanted to get behind the wheel of a supercar, GT Driving Courses are a popular choice. For around 100euros you can get behind the wheel of a Lamborghini or Ferrari (along with a host of other cars) and head out for a few laps of the circuit. Track Days are offered as well when you can take your own car or motorbike out on the circuit after which you’ll be invited to enjoy a lunch buffet In the Panoramic Club restaurant. Go Karting has been a popular entry point into the world of F1 for many years. If you want to try your hand at some high speed laps then taking a Go Kart around the specially designed Paul Ricard Circuit kart track might be for you. It’s great value as well at just 20 € / person for a 10 minute session. There is also a dedicated Go Kart training circuit for children aged 7 to 15 years. Full courses are offered for children where they are taught the basics of driving from an early age. You could consider dropping the kids off for their karting session before you yourself head to the main circuit for a GT Driving Course. Not only in the main circuit a big lure for visitors to the region but the Circuit Paul Ricard also owns an adjoining park called Xtreme Park which offers a massive range of activities for adults and children alike. Try out driving simulators and quad bike rides before heading to the adventure park which has breath-taking zip lines between circuit and sea, a free fall jump tower and a climbing wall. Xtreme Park is also the meeting point for guided tours of the main circuit itself which are well worth going on. Your guide will take you to the most important places of the Paul Ricard Circuit allowing you to see the paddocks up close, the lobby of Pit Building and the Media Centre whilst learning about the history of the circuit. You can easily occupy a full day at the Circuit on non-race days and for those who love their motorsports I have no doubt will happily enjoy more time on top. A fantastic destination for the whole family! Well I never! I didn’t even know that the French Grand Prix is back. I can think of few events that will be more stylish than a French Grand Prix in the south of France towards the end of June. Unfortunately I already have a diary commitment for that day but has the circuit been awarded a race for the 2020 season? The best thing about track days is that you can finally have a go and live out your fantasies. I was lucky enough to drive what should have been a really fast Mercedes Sports Car at Brooklands. I had always assumed that I would be a natural, a born racing driver. Getting about 2 corners right out of about 20, reality struck. Racing is far tougher than I ever imagined. These race days are a great reality check. My husband has gone on and on about going to a Grand Prix. So far I’ve never really fancied the destinations and most of them are so far away. Maybe, just maybe, the glamour of a French Grand Prix could persuade me to go with him. I like the fact that there are so many hands-on activities for kids. If mine are anything to go by then just watching simply isn’t enough for them. They always love go-karting and I think they’d go for the driving simulators at Xtreme as well. The entrepreneurs have put together a tempting package and hopefully with good weather too.